During my time here in Bangkok, I have many things on my "bucket" list. One of which is to run a race at an organized event. I have been watching out for events but race schedules don't seem to be posted in an easy format for me to read (i.e., English). Fortunately, I have many wonderful Thai associates friends looking out for me. Weep found one this race and it is a perfect distance for me, not only in length of the race but distance from my hotel. The start is really only a kilometer or two from my hotel. So as you have read up to this point you are probably thinking, "You are going to run a marathon? I have been watching your training and you are NOT ready to run a marathon." One thing I've discovered out here is that everything is a marathon. In fact, I have seen signs for a "Ironman Marathon Race", which was just a 5k/10k run. You get the idea. I'm not sure the World Triathlon Corporation (owner of Ironman trademark) would appreciate that. Although, even people in the US have trouble with this as well. This is a 11k run (or 6.8 miles for you westerners), not 42.1 kilometers. It is the perfect distance for my weekend long run (which would matter if I had gotten my mid-week runs in). As you might have been able to surmise from the title, this is to benefit the Japan Tsunami that occurred almost exactly one year ago as well as the victims of the flood that ravished Thailand in the fall. 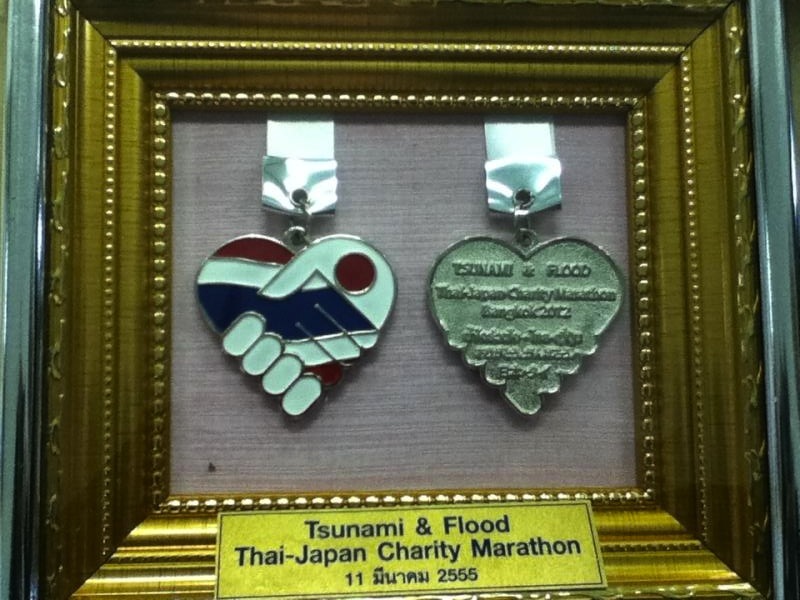 Many of the Thai associates were impacted by the flood. I'm going to run by heart rate but will plan to stick with my Thai friends. It's a training run... of course if I see an opportunity to 'bring home a trophy', I'll do it but I don't think that is possible. Oh, and yes... bringing home a trophy is the correct phrase, that's what the 1st through 5th place runners get. The beautiful part is each finisher receives a medal. It will be one of my favorite souvenirs from this trip for sure! I don't think this is actual size... if you could tell what that was in the first place. I haven't posted anything this week as I've been too busy to sit down for a few hours to push out a blog post; however, we had a wonderful time last weekend at Hua Hin, a beach a couple hours from Bangkok. I will be working up a post over the next few days.... as well as my race report!!! Have fun! I'm curious to hear about aid stations and the post-race spread. Just posted my race report.... I added some comments about it.